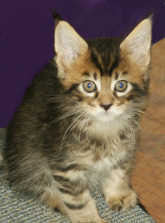 Callan is a wonderful brown mackerel tabby boy who comes to us from our dear friend Keri Chapman (Coondalay). Hips: Good to very good at 1 year of age. Heart: Normal. Screened via Doppler ultrasound at 1, 2, and 4 years of age. Callan is DNA Negative for the cMyBP-C HCM gene. Pedigree: Callan is out of SGC Holdermaines Mac Tabulous and CH Pinecoon She's Somethin' Else. Click here for a full five-generation pedigree. Callan is a stunning cat (no, we're not biased :-). His gorgeous warm caramel color and his striking mackerel pattern certainly don't hurt; but what we really love about him is his wonderful type: heavy boning, large ears, open yet masculine expression, long square muzzle, and lovely clean profile. Supreme Grand Champion (SGC) -- Callan finished the requirements for his SGC in just 3 shows and one ring. 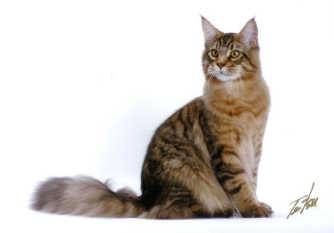 His final requirement was met with a Best Longhair Cat in Elaine Weitz's ring at the Victoria, BC show in April 2006. Best Cat in Show -- Callan was the overall highest scoring cat at the big 3-day show in Seattle, WA, held by The Evergreen Cat Fanciers in February 2006. 2nd Best Cat In Show at the Garden City show in Victoria, BC in April 2006. Callan's adult show career began with a real "bang" -- in his first adult show (at 8 months and 1 week) he earned finals in 10 out of 12 rings, and completed the requirements for his Double Grand in a single show. 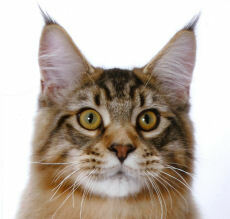 His second show was even better: at the big 3-day Valentine show in Seattle, Callan was the highest-scoring cat in the whole SHOW! (And this at only 8.5 months of age!) By Sunday morning, Callan had completed the requirements for his Quad Grand Championship -- in just two shows. We are looking forward to more shows, and hope he'll continue to do as well as he matures!